Rivington School Sculpture Garden portfolio, featuring photographs by Toyo Tsuchiya. The cover features a 20″ panoramic view of the sculpture garden in 1987. Gallery 98’s current online exhibition Linus Coraggio, Toyo Tsuchiya, and the Rivington School, 1983–95 resurrects the idiosyncratic junkyard sculpture garden created by artists who called themselves the “Rivington School.” A chaotic collection of metal scraps welded together, reaching 20 feet high at some points, the crammed assemblage was demolished in 1987. A highlight of the online exhibition is a specially created portfolio of photographs by Toyo. 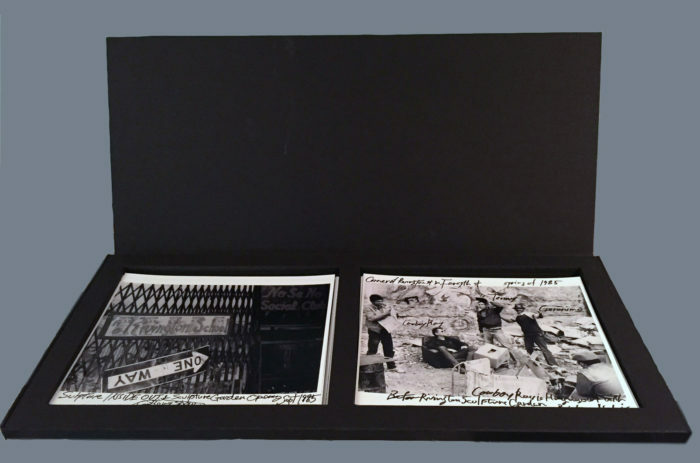 The portfolio, made of matboard and foamcore, measures 23 3/4 inches across, and features as its cover a panoramic view showing the garden as it looked in 1987. Inside are an additional eleven 8″ x 10″ digital prints that have been signed and annotated by Toyo. Open view of the portfolio. Eight of the twelve photographs in the portfolio. Toyo has inscribed each by hand.